As you are all no doubt aware, we were very excited and proud to be awarded the Queens award for voluntary service earlier this year, which is akin to an MBE for the voluntary sector. Marcia has explained how winners are selected in other newsletters and press releases issued during the last few weeks and months. 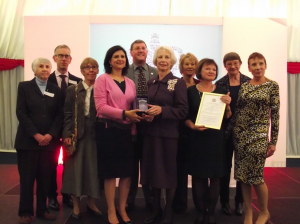 On the 18th November myself and 3 other Board members and 6 of our long standing volunteers went along to Newbury College to collect the award from HRH The Duke of Gloucester, who was accompanied by The Lord Lieutenant of Berkshire. Seven charities were winners this year, however ours was the only one that worked specifically with children in an education related field. The award will be on display at our coffee morning on the 11th December and I hope to see many of you there. It is, of course, so easy to get carried away with pride in our achievement! The greater test will be not sitting on our laurels and making sure that we maintain and enhance our reputation within the charity sector. As it said on the accompanying certificate, this award was given to us “for as long as we continue” to provide the services for which we were so recognised by Her Majesty the Queen. Onwards and Upwards then. In the meantime I wish you all a wonderful Xmas and New Year with your loved ones. And congratulations to you all, once again. Again, another busy term and I would like to start the letter with a few thank yous! Thank you to those of you that have taken part in our new volunteer training programmes by chatting about your role to our new volunteers. Our trainers have really appreciated your input and I hope you enjoyed taking part. Thank you also to those who helped distribute some of our recruitment leaflets in order to try and encourage more applicants and schools to work with ABC to read and also those that have assisted at our recruitment events. All your extra support for ABC to read is of a huge help and very much appreciated. I would also like to thank the volunteers that many of you do not get a chance to meet at our book exchanges and workshops; they are often behind the scenes but doing a fantastic job, helping the charity raise funds and assisting with PR and marketing. In November, at a special ceremony we received a certificate signed by The Queen and an exclusive commemorative crystal, presented by Her Majesty’s Lord-Lieutenant. This is a unique UK national honour, which was created by Her Majesty to mark the Golden Jubilee in 2002 and to recognise the outstanding contributions made to local communities by groups of volunteers. It has an equivalent status for voluntary groups as the MBE has for individuals. Thank you to all of you for enabling this to happen! For those of you that went along, I hope you had a fantastic time and came away feeling proud of your achievement I hope you have all received the information about being able to purchase the Queen’s Award memento, if you have not, and would like the details then please contact us at the office. Please see a photo of all who attended on the next page. We believe that this increase is in large part due to the increased attention that has been given to focused reading with this age group. This has helped us with our volunteer recruitment campaign so that we can also get more schools on board and help with raising our profile. We would like to welcome our many new faces to the volunteer team and we hope you are enjoying your time with the children and finding it rewarding. I look forward to meeting some of you at the Christmas coffee morning and I hope you enjoy the time catching up with one another. One of our Trustees, Sarah, will be coming around to chat with some of you in order to gain some quotes. The quotes will go towards case studies that we hope to put together and will enable us to showcase our impacts and needs further. It is with great regret that we advise you of the passing of Kathy Paterson. Kathy was a volunteer at Geoffrey Field Primary. I’d like to share with you some of the words taken from her Localgiving page. “Kathy loved words; she loved books; she loved stories and she loved to share: Kathy was a true wordsmith – a person who knew the magic of words. In the spirit of this, when she retired, Kathy volunteered for ABC to Read – A local charity which works with Berkshire schools to help raise literacy standards and for whom Kathy volunteered. The school in which she volunteered have said, “We would often hear children reading with Kathy – acting their way through what they were reading – in a way that they would only have the confidence to do if it was someone they trusted and liked. The relationships Kathy created with the children were very special. She was always warm and encouraging, not just to the children, but also to us as teachers.” Kathy asked that ABC to Read be one of her two nominated charities and asked that donations be made to these charities as an alternative to flowers at her funeral. We do now have a Localgiving button on our website if anyone would like to make a donation in Kathy’s memory. Again we have taken part in radio interviews and had many press releases go to print along with Mike, our Trustee, appearing on BBC news. These were all on the back of the latest report released last month by the Department for Education. The report identified that 74% of Year 1 pupils met the expected standard of phonic decoding in 2014, compared with 69% in 2013 and 58% in 2012. 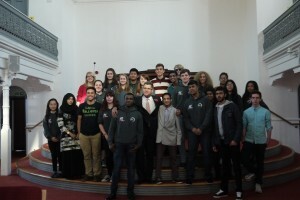 An example of having our profile raised: The National Citizenship Service (NCS) programme has brought together 3 groups of enthusiastic young people (16-17 years old) to work on social action projects of their choice. The groups have conducted research, held planning sessions and attended the Dragon’s Den themed session where they pitched their project plans in front of 4 Dragons. We were selected as one of the charities to work with and the group decided that they wanted to raise money to buy Kindles to encourage a modern and fun learning experience for children and to motivate them to do more academic work both at home and school. The Kindles will also provide an opportunity to experience modern technology for some children who do not have access to IT at home. The team plan to seek some funding from large companies too. All the teenagers are aiming to make a positive difference in our community and their hard work has clearly shown through their commitment towards these social action projects. By the time you have received this letter, we may have been presented with the Kindles. I am not sure how many will be donated to us from their fundraising, but I am expecting approximately 20 with ongoing support from them. If you are a confident Kindle user and would like to use one of the Kindles with the children that you are working with then please advise your fieldworker. In order for us to abide by safeguarding and child protection we will ensure a user agreement is signed by you and set up within school. We have recently sent out our school’s evaluation and will be advising you in due course of the wonderful out-comes of the work that you are doing. We have had several great responses so far and it is obvious that the children are making a great improvement not only in reading but their attitude to learning and communicating. Thank you to all that helped with the distribution of the forms to the correct contact within school. In order to maximise our recruitment for new volunteers we are keen to hear about all local magazines that we could advertise in. We would be very grateful if you could email marciarowlinson@gmail.com with the details of any local magazines that come through your door so we can make sure we use those. Meanwhile enjoy Christmas with friends and family and of course with the children in school. Once again, on behalf of the staff and Trustees, I would like to thank you all for your support and dedication in ABC to read’s achievement and I look forward to another successful year with you all and have a Happy New Year!